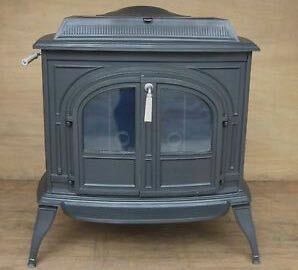 The Vigilant wood stove was produced by Vermont Castings in 1977. 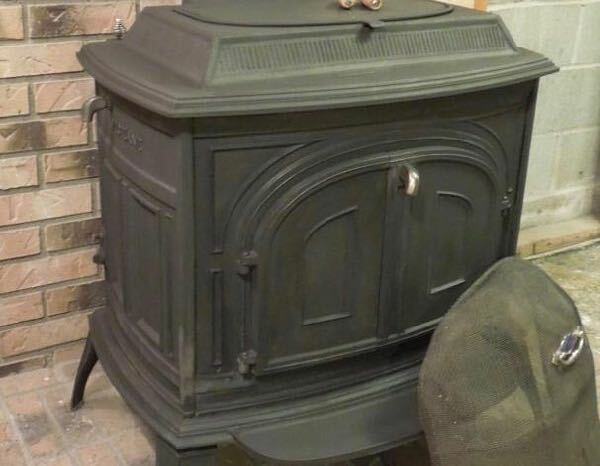 Although the company first manufactured the Defiant wood stove in 1975 they followed up their popular design with the slightly smaller Vigilant a couple years later. If you look at the stove you'll notice the year 1977 in the front casting. Since the stoves were produced for several years, this doesn't necessarily mean your particular stove was made in 1977, it's simply the date built into the cast. In fact, most of the stoves that are still in use today were probably built in the early 1980's. If you have an old Vigilant stove and would like to know the date it was produced, look for a sticker or placard on the stove which will indicate when it was originally tested. Don't be surprised though if the sticker is missing. Although they don't compare to the new EPA certified stoves built today, the Vigilant is a great wood burning stove. Capable of delivering more than enough warmth to heat an average sized home, the stove was technologically advanced for its time because it featured a secondary combustion system that was designed to achieve a smokeless and efficient secondary burn to increase the efficiency of the stove. One small drawback of the stove is that it can be somewhat temperamental to achieve the "perfect" burn where it's burning efficiently without firing too hot. To learn more lets take a closer look at the stove. The Vigilant stove is really an awesome stove for the time period and many stoves are still in use today. Just like any other wood stove, the Vigilant has some "quirks" that may take a couple fires to completely figure out just because it has a bypass damper, but once you learn to read the stove and develop a good routine, it throws out a lot of heat! Plus you'll have enough coals to relight the fire about 7-8 hours later. Before you light any fire in the Vigilant, make sure you have about an inch of play sand in the bottom of the stove. You can use ashes, but the sand works a lot better. Without the sand to insulate the bottom of the stove, it will become too hot and crack. To get the best results when first lighting a fire, open the damper all the way by putting the handle in the vertical position. Now start the fire using good quality hardwood and allow a nice bed of coals to form. Sometimes it helps to crack the door a little bit for a few minutes until the fire gets going, then shut the door. After about 30 minutes, top off the stove with good seasoned firewood and allow the wood to burn for a few minutes making sure not to fire the stove over 600 degrees. Be careful when loading through the top loading door not to burn your hands or burn your hair and face. Next, fully open both the primary and the secondary air and place the stove into horizontal burn mode by moving the lever to the horizontal position and keep an eye on the griddle temperature. Back down the primary air until you maintain a griddle temperature of about 550 degrees but not exceeding 600 degrees. Generally you'll have the primary air open about 1/4 inch. That's it, the stove should now be utilizing the secondary combustion and burning relatively clean without much....if any smoke. You'll know it's utilizing the secondary combustion because the stove panel that surrounds the secondary combustion chamber will be very hot. Overall, the Vigilant wood stove is a great stove that's been around for many years. Although it's not an EPA certified stove, it truly was ahead of its time back in the early 1980's. Just remember the stove needs dry seasoned firewood in order for the stove to burn cleanly in the secondary combustion mode. Wet wood just won't burn hot enough and the stove will produce a lot of smoke and potential creosote. Today's modern EPA certified stoves can achieve a secondary burn almost effortlessly, so you'll want to consider this before buying a wood stove or making your final selection. Also, since the Vigilant likes to burn hot it's tuff to use during the shoulder months when the outside temperatures are mild since it supplies so much heat.